Last week my husband, Justin, left for a late winter adventure to Mount Katahdin, Maine’s tallest mountain, and the northern limit of the Appalachian Trail. The trip is an annual tradition amongst some of the outdoorsiest men of his family, along with a motley crew of backcountry skiers and ice climbers hailing from the mid-coast, the county (that’s Aroostook, if you’re not from Maine), and a possible New Hampshire straggler. Lest I mislead you with my title, or the photo above, I should clarify that I’ve been left at home with a half bucket of mozzarella, not a full bucket. The first half of the bucket went toward Justin’s edible contribution to the trip, a dinner of pizza rolls for the gang. Luckily, the nice people at Micucci Market suggested to him a 3 lb. bucket of Fior di Latte. Using his own good sense he decided on 2 lbs. of sopressata and capicola. Containing 12 balls of mozzarella, the bucket cost a whopping $16. I love Miccuci. Before heading off to the snowy peak of Maine’s highest peak, Justin bode me farewell, and instructed me to eat the mozzarella. And so I did. One of my favorite jobs at work is taking on any project that involves InDesign, Adobe’s desktop publishing program. Sometimes, however, the program gets the best of me, and I lose track of time and space. Earlier this week I had one such afternoon, but luckily the bucket of mozzarella had my back. That morning I had whipped up a sandwich of sopressata, mozzarella, baby chard, and whole grain mustard on Rosemont’s whole grain scala bread. Dying of hunger and tired of sitting down, I ate the sandwich standing while staring mindlessly out the window. Memory transported me back in time, to a crowded train in Italy. I was 22 years old and generally trying to decide where the next chapter of my life would take me. When I boarded the dustyregionale in a small port town on the Adriatic coast, there was only standing room. I arranged myself between the other passengers bound for Bologna, and attempted to pass the time with a book. About half an hour into our journey, the young woman with a bob haircut who was standing beside me, unearthed a sandwich from her bookbag. I didn’t think that I had been gazing at her lunch with longing desire, but she must have known I would not refuse her offer of half the sandwich. She told me that her father had made it for her as she got ready to head back to university. I’ve had two transcendent moments with mozzarella, and this was one of them. While the other involved a late-night party in southern Italy, playing cards and gorging on huge braids of buffalo mozzarella as if common bar mix, this moment was quiet, simple, and remarkably clear – even when I think of it now. 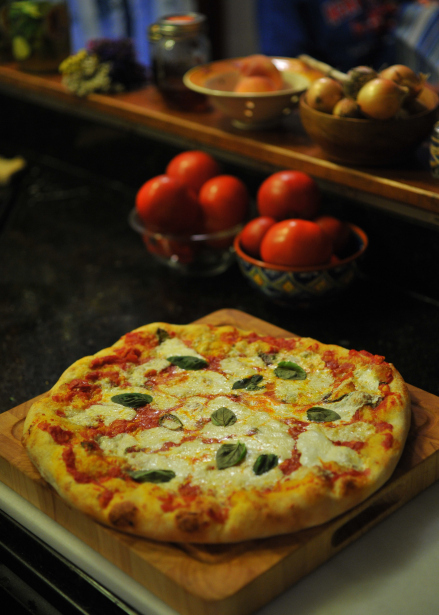 My realization was this: mozzarella is made more fantastic when put in contact with just the right ingredients. In other words, the cheese on its own would have been good, yes, but it became superior – magical – when paired with the bread and greens that comprised the other components of this simple sandwich. It was transformed. The greens, picked from her father’s garden, were fresh and bitter, tossed with a fruity olive oil and an expertly assessed dressing of salt (Italians seem innately to know better than the rest of us how to salt their greens). This fruity, bitter, salty mix mingled perfectly with the slightly sour juice from the mozzarella, and yeasty, baked flavor of the bread. With each bite I marveled at how harmoniously they shared the spotlight, elegantly giving way to one another. In taste and texture, both. 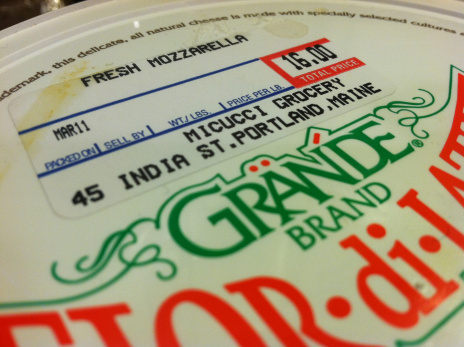 From this moment forward I understood mozzarella differently. I realized that one of pizza’s greatest victories lies in the slurry of liquid that forms between the tomato sauce and mozzarella run-off. And a quick bowl of spaghetti with pesto can have no greater favor done for it, in my opinion, than to be topped with a few chunks of mozzarella and fresh tomato. That evening, as I maunched down my bowl of pesto (Rosario’s, so good), made silky by mozz and zesty by “cocktail” tomatoes (who puts them in a cocktail? ), I thought about how it is, in some regard easier to taste the full flavor of mozzarella when it is eaten with something else. In fact I was still tasting it as I ate my imperfectly salted green salad. It was a full day of mozzarella, for sure, and I made positive progress on my promise to Justin. However, the days ahead had other plans for me, and no more meals at home. Luckily the bucket kept the remaining cheese fresh. And so we celebrated his return with what else – pizza.